You just never know about the weather for Folklife Festival. Two years ago it was too hot and sunny. Last year it threatened rain but turned sunny. This year it was cloudy and chilly the entire sketch outing. 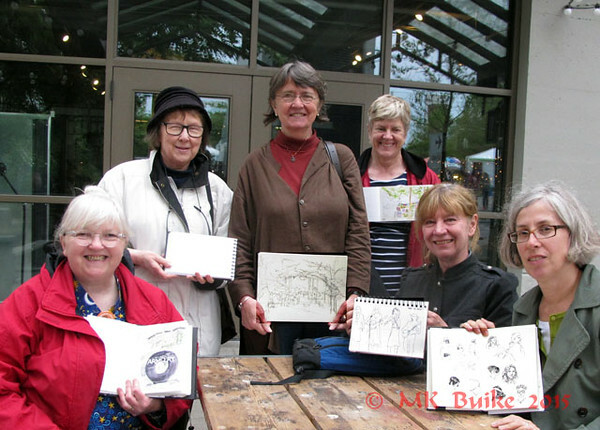 This was the USk Seattle Friday group's second annual outing to Folklife. We go when it first opens so it's not as crowded as later in the weekend. My route included bus, lightrail and monorail. 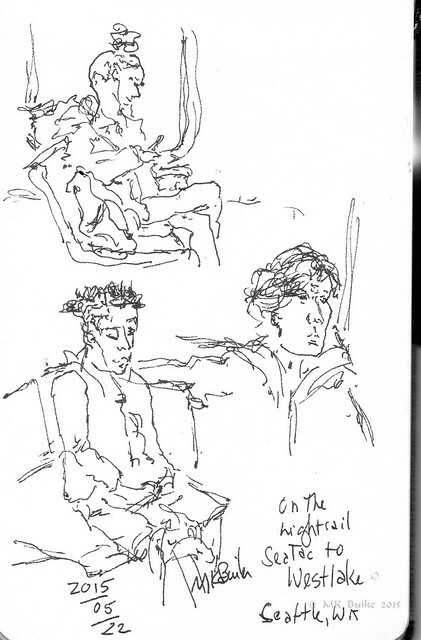 These sketches were done on a page in my pocket sketchbook while on the lightrail from Tukwila to Westlake Center. As usual, I arrived early. 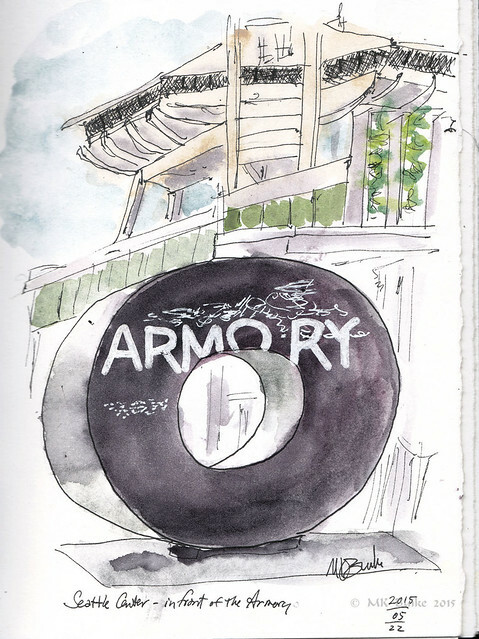 I had a coffee to keep warm and sketched this sculpture outside the Armory. It's a sculpture with the base of the Space Needle in the background, above. My preference would have been the Trad Stage, with traditional Celtic music. But it didn't start live music until 1600. 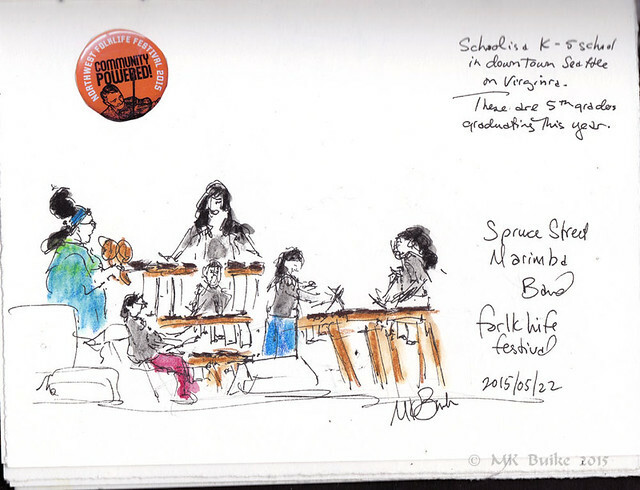 So I opted to attempt a sketch of the Spruce Street Marimba band at 1100. It was the opening act on the Fountain stage. There was a lot of action! These are 5th graders and performed a half hour show without sheet music. They had it all memorized! I've heard them before and they are fantastic! Their teacher is on the left. I did some wandering and looking at the various vendors. 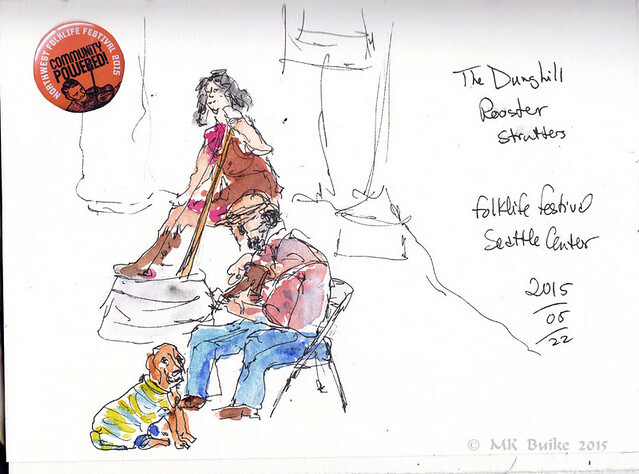 I stopped to listen to these buskers and did a quick sketch. The dog seemed bored with it all. They are the Dunghill Rooster Strutters. There were just 6 of us today.